This includes undertaking work experience along with support to learn how to search for and apply for jobs. 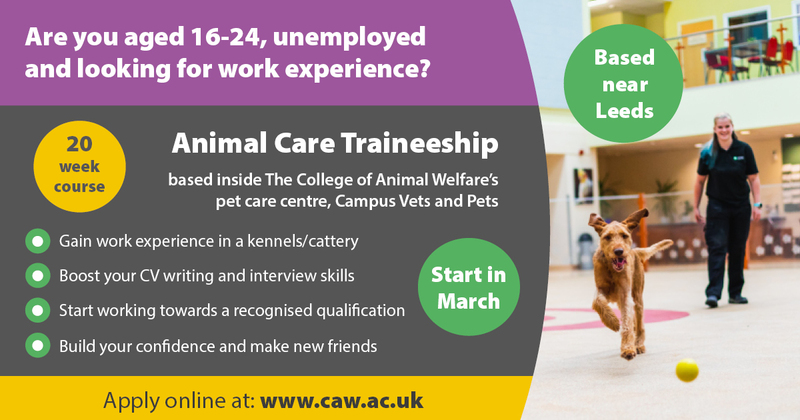 At the end of the Traineeship, the individual could potentially achieve an Animal Care and English and Maths qualifications as well as the opportunity to gain feedback and a reference from their work placement. The Traineeship lasts 12 weeks and is available at our Leeds Centre. It is due to start Tuesday 23 July 2019. This Traineeship is an opportunity not to be missed! As attendance levels must be over 90%, you need be reliable and enthusiastic in order to successfully complete this programme. Don’t worry if you haven’t got experience or the know-how, that’s what the programme is for! All you need to bring is the right attitude and willingness to learn. Register your interest in our traineeship programme using the form below, and we will be in touch to discuss inviting you to an interview day, taking place 3 July 2019.